This cache was approved by The WV State Park service to be placed in the Tu Endie Wei State Park. Confluence, in geography, describes the meeting of two or more bodies of water. It usually refers to the point where a tributary joins a more major river. 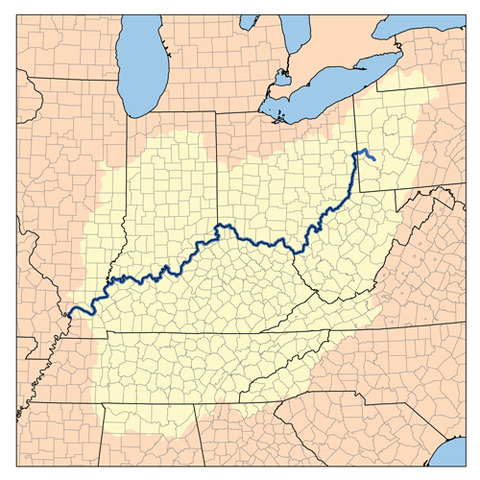 A notable confluence is the merging of the Monongahela and Allegheny Rivers. This merging point is the beginning of the Ohio River, thus forming a confluence in Pittsburgh. Then the Ohio meets the Mississippi for another notable confluence. A large natural stream of water (larger than a creek). A river is a large natural waterway. It is a specific term in the vernacular for large streams, stream being the umbrella term used in the scientific community for all flowing natural waterways. In the vernacular, stream may be used to refer to smaller streams, as may creek, run, fork, etc. A River starts at a point called its source, and enters a sea or lake at its mouth. Along its length it may be joined by smaller rivers called tributaries. A river and its tributaries are contained within a drainage basin called the watershed. The point at which two or more rivers join, is called the confluence. The Ohio River is the largest tributary by volume of the Mississippi River. It is approximately 981 miles (1,579 km) long and is located in the eastern United States. The river had great significance in the history of the Native Americans. It was a primary transportation route during the westward expansion of the early U.S. It flows through or along the border of six states, and its watershed encompasses 14 states, including many of the states of the southeastern U.S. through its largest tributary, the Tennessee River. The Kanawha River (pronounced kuh-NAW or less often ka-NA-wah and earlier, kuh-NOIE) is a tributary of the Ohio River, approximately 97 mi (156 km) long, in the U.S. state of West Virginia. 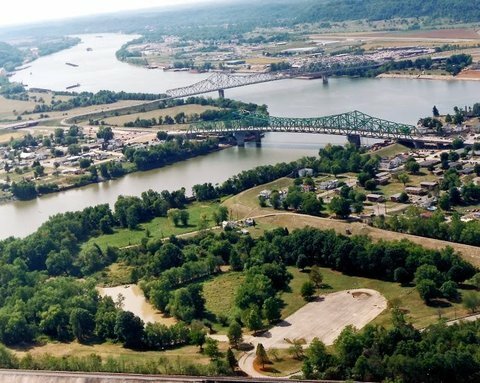 The largest inland waterway in West Virginia, it has formed a significant industrial region of the state since the middle of the 19th century. It is formed at the town of Gauley Bridge in northwestern Fayette County, approximately 35 mi (56 km) SE of Charleston, by the confluence of the New and Gauley rivers. 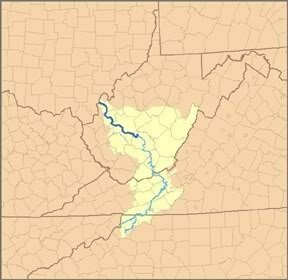 It flows generally northwest, in a winding course on the unglaciated Allegheny Plateau, through Fayette, Kanawha, Putnam and Mason Counties, past the cities of Charleston and St. Albans and numerous smaller communities. It joins the Ohio at Point Pleasant. 3. Estimate within +/- 40 yards, the width of the Kanawha River in yards. 4. Estimate within +/- 100 yards, the width of the Ohio River in yards. 5. What is the name of the ship that the nearby anchor at N 38 50.344 W 082 08.475 sank?